Robinson & Sawyer, Inc. provided plans, bidding services, and construction administration for the construction of approximately 6,500′ of sanitary sewer line to replace a portion of High Shoals’ decades old sewer system. 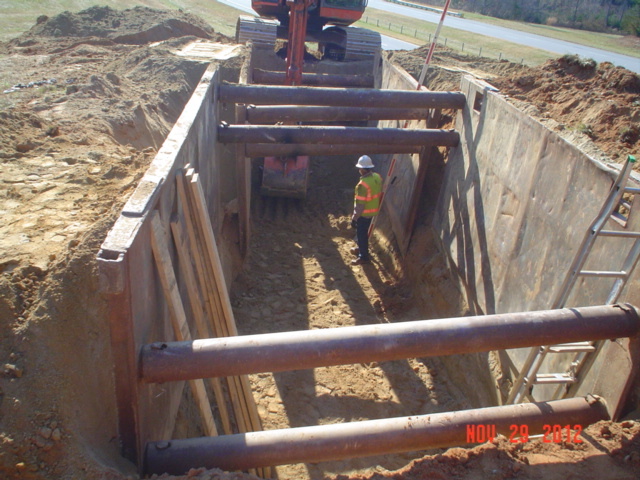 Robinson & Sawyer, Inc. worked closely with NCDEQ-DWI to insure all requirements of the grant funding were achieved throughout all phases of the project. The project included installations by bore to minimize impacts to NCDOT roadways. 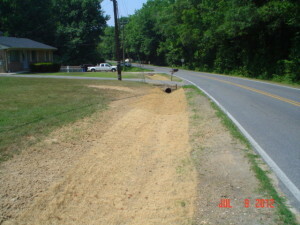 The project also included numerous driveway replacements, sections of sidewalk replacement, and erosion control measures. Significant efforts were made during design to minimize impacts to the existing line so sanitary sewer service would remain in place to customers during construction. 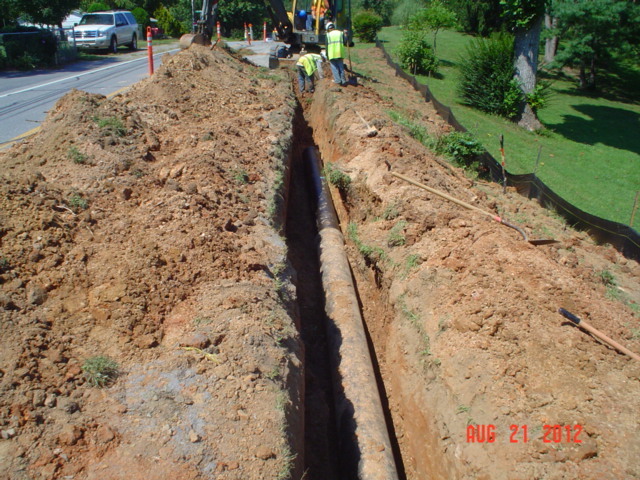 Robinson & Sawyer, Inc. provided plans, bidding services, and construction administration for the construction of an 8″ water line along the length of Harwell Rd. in south Gastonia. Several service connections were included along the length of the project as well as the closure of an existing well. As part of their efforts to replace water lines in the area of the intersection of NC Hwy 16 and NC Hwy 73, Lincoln County hired Robinson & Sawyer, Inc. to provide plans for installing approximately 1,000′ of 24″ water line. The project included a major gas line crossing as well as a stream crossing. The new line also traversed in front of a proposed shopping center under construction during the installation of the new water line. Robinson & Sawyer, Inc. coordinated the plans for the new water line to provide necessary connections for the new shopping center. Robinson & Sawyer, Inc. provided plans and bidding documents for a 2″ water line extension approximately 675′ long to serve a newly annexed area of High Shoals. Construction administration throughout the construction phase of the project was also provided. Robinson & Sawyer, Inc. researched the age and condition of High Shoals’ existing water and sewer systems and prepared a Capital Improvement Plan. Proposed capital projects were prioritized based on need. Pre-design cost estimates were provided for each project. A water and sewer Asset Management Plan was composed utilizing the CUPSS software. This plan included databases of all known assets associated with the city’s water and sewer systems, including age and condition of each asset. The plan also included maintenance schedules and financial summaries to assist the city in all aspects of maintaining their water and sewer system assets. Robinson & Sawyer, Inc. provided mapping for utilities based on collections of previous design plans, maps and other available resources for the cities of Lowell and High Shoals. Robinson & Sawyer, Inc. provided the design plans, bidding services and construction administration for the replacement of 200′ of sanitary sewer line serving Kiser Elementary School. Robinson & Sawyer, Inc. provided the design plans, bidding services and construction administration for the replacement of 360′ of sanitary sewer line serving W. C. Friday Middle School. Robinson & Sawyer, Inc. provided the design plans, bidding services and construction administration for the replacement of 370′ of sanitary sewer line serving Ashbrook High School. Also included in the project was replacement of a retaining wall along the length of part of the sewer line. Robinson & Sawyer, Inc. provided the design plans, bidding services and construction administration for the replacement of the pump station serving Forestview High School and W.A. Bess Elementary School and all associated appurtenances. Also included in the project was the 700′ extension of a sanitary sewer line to serve the visitor’s side of the Forestview football stadium. Robinson & Sawyer, Inc. provided the design plans, bidding services and construction administration for the 1000 LF replacement of an existing 8″ gravity sewer line and 1900 LF replacement of various sizes of water line that serve Holbrook Middle School. The project required careful consideration of existing infrastructure including utilities, sidewalks with canopies, landscaping, and mobile units with the courtyard area where utility replacements were required. Robinson & Sawyer, Inc. provided the design plans for the 700 LF replacement of an existing 8″ gravity sewer line and 1500 LF replacement of various sizes of water line that serve South Point High School. The project also included the extension of a storm drainage line to alleviate drainage problems in a courtyard. The design work was completed in a timely manner so construction could be completed during summer break. The project consisted of replacing approximately 4,000 LF of 8″ sanitary sewer and reconnecting approximately 52 services to the new sewer line. Robinson & Sawyer, Inc. provided design surveys, design plans, specifications, contract documents, bidding services, construction administration, easement acquisition survey and mapping, and final project certification. Client: Veolia Water North America-South, LLC. 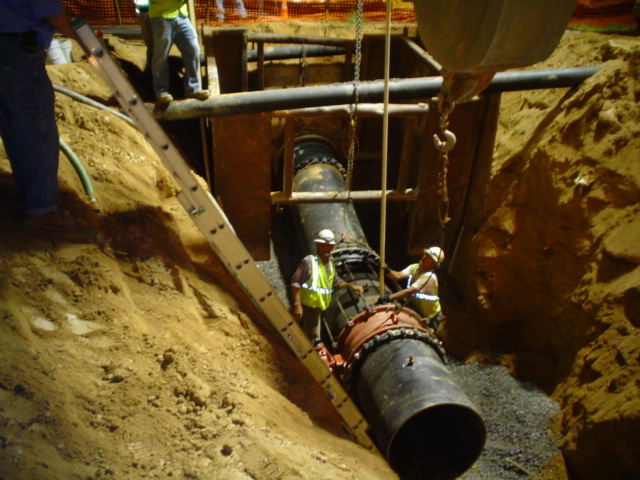 The project consisted of extending the Town of Weaverville’s public water system as follows; 1,866 LF of 12 inch water line including 30 LF of 24 inch steel encasement pipe installed by bore and 393 LF of 8 inch water line. The project also included the replacement of 2,522 LF of 6 inch and smaller water lines for Veolia Water. Robinson & Sawyer, Inc. provided design surveys, design, plans, specification, contract documents, bidding services, construction administration, right-of-way and easement acquisition surveying and mapping, and final project certification. 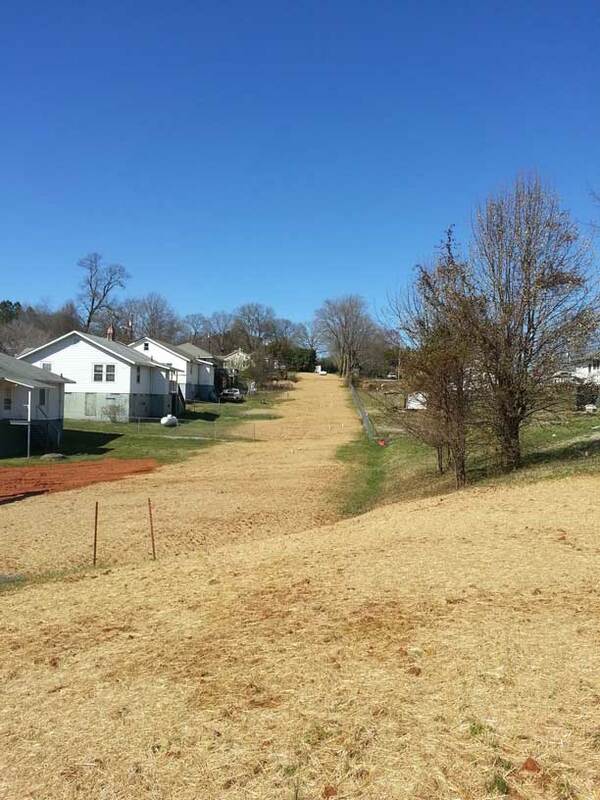 The project consisted of extending the City of Gastonia’s public water system by installing 270 LF of 12 inch water line including 35 LF of 16 inch steel encasement pipe and replacing 5,737 LF of 4 inch and smaller water lines for Veolia Water. Robinson & Sawyer, Inc. provided design surveys, design, plans, specification, contract documents, bidding services, construction administration, right-of-way and easement acquisition surveying and mapping, and final project certification. The project involved preparing a tract of City owned property on Long Avenue adjacent to the City’s primary water treatment plant. The site was being prepared for commercial development and required the relocation of a 36 inch water main (a critical connector between the City of Gastonia’s Northern and Southern trunk lines). The project also involved the relocation of a 30 inch alum sludge line that discharges from Gastonia’s primary water treatment facility on Long Avenue. Robinson & Sawyer, Inc. provided design, construction plans, technical specifications, construction observation and record drawings. Assisted Lincoln County in completing this project. Robinson & Sawyer, Inc. provided design surveys, right-of-way acquisitions surveys, prepared design plans and provided construction administration services for the completion of the project. The project consisted of 825 LF of 24 inch, 42 LF of 12 inch, and 58 feet of 8 inch water line. The project also involved installation of 100 LF of 36 inch and 108 LF of 24 inch steel encasement pipe installed by bore under the NC 16 By-pass Ramp and NC 73. Project completion costs were less than originally anticipated. The project consisted of the installation of 1,100 LF of 12″ and 2,670 LF of 24″ water line and appurtenances. Robinson & Sawyer, Inc. provided design surveys, design, contract documents, and right-of-way acquisition surveying and mapping. Robinson & Sawyer, Inc. provided design surveying for the 12 mile High Shoals Interconnect sewer line as well as design plans for 1,200 LF of 8″ gravity sewer line and 2,600 LF of 4″ force main to serve the proposed Gaston Eco-Industrial Park by way of the new proposed High Shoals Interconnect being designed by HDR Engineering. Robinson & Sawyer, Inc. worked closely with HDR to provide the survey information and data they needed to undertake the design of the large interconnect project. A joint Gaston County/City of Gastonia CDBG project. The project was designed by the City of Gastonia and paid for with Block Grant funds obtained by Gaston County. Robinson & Sawyer, Inc. was hired by Gaston County to administer the construction of the project by providing periodic construction observation and construction administration. The project consisted of construction of 6,470 feet of 8″ sanitary sewer and connecting 93 residences. A joint Gaston County/City of Gastonia project. The project was designed by the City of Gastonia and paid for by Gaston County. Robinson & Sawyer, Inc. was hired by Gaston County to administer the construction of the project by providing periodic construction observation and construction administration. The project consisted of construction of 8,815 feet of 8″ sanitary sewer and connecting 84 residences. The project included 1.5 miles of 6″ and 8″ water line, 1.1 miles of 16″ water line, 2.8 miles of 8″ and 10″ sanitary sewer, 0.6 miles of 10″ force main and pump station. Robinson & Sawyer, Inc. provided design surveys, design, contract documents, construction staking, construction observation, and right-of-way acquisition surveying and mapping. The project included 2.5 miles of 8″ water line, 3.6 miles of 8″ sanitary sewer. Robinson & Sawyer, Inc. provided design surveys, design, contract documents, construction staking, construction observation and administration.